Posted on 22, January 2019 by EuropaWire PR Editors | This entry was posted in Financial, Insurance, Investment, Italy, News and tagged A- (AM Best), anco Santader S.A., Assicurazioni Generali, Baa3 (Moody’s), BBB (Fitch), BNP Paribas, cost of debt, Cristiano Borean, debt, Goldman Sachs International, HSBC, institutional investors, issuance, IVASS, Luxembourg Stock Exchange, Mediobanca, Solvency 2 quality of capital, subordinated bond, Tier 2 regulatory capital, UNICREDIT. Bookmark the permalink. TRIESTE, 22-Jan-2019 — /EuropaWire/ — Generali today launched a subordinated bond with a 10 years bullet format targeting institutional investors for an overall amount of € 500 million. 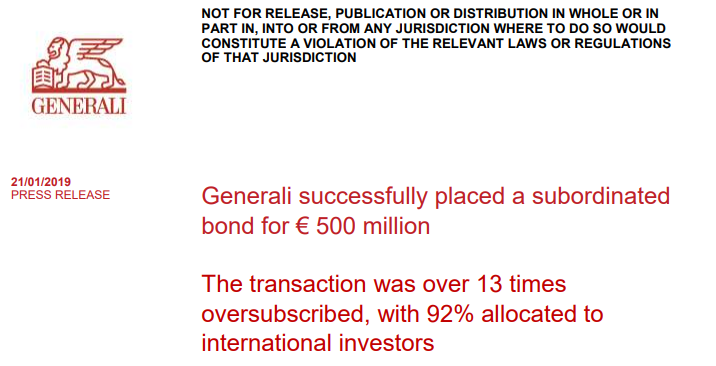 At the initial yield guidance of 4.625%, the issuance attracted around 450 orders for more than € 6.5 billion, more than 13 times the target size. The Group CFO, Cristiano Borean, commented: “The success of this transaction reflects our solid financial position and the trust investors have in our Group’s strategic plan announced in November 2018. In line with the plan to reduce our financial debt over a 3 years period and lower the interest expense, we issued 500 million to reimburse 750 million with a significant reduction in the cost of debt. The difference of 250 million will be financed from internal resources. The 10 years bullet structure ensures the preservation of the Solvency 2 quality of capital and provides our credit investors an additional instrument through which take exposure to Assicurazioni Generali debt”. The transaction was over 13 times oversubscribed and the issuance attracted strong interest from international investors, who accounted for approximately 92% of allocated orders, confirming the strong reputation the Group enjoys on the international markets. 10% of the bond has been allocated to UK & Irish investors, 8% to Italian investors, approximately 29% to French accounts, 15% to German investors and 19% to Nordics. Given the strong demand, the yield guidance on the bond was subsequently reduced to the final 3.875%, the lowest coupon ever paid by the Group on a subordinated security. The bond, which qualifies as Tier 2 regulatory capital, is intended to partially refinance € 750 million subordinated liabilities callable in 2019; the early repayment, by law, has been authorized by IVASS.